Last Friday, the proposed Northern Links project launched early concept designs that would aim to make it easier for residents to travel on foot and by bike more often for their local journeys on certain Dundee main streets, by improving the opportunities for and tackling barriers to active travel. Northern Links aims to reallocate some road space in favour of cyclists and people rather than traffic, attempting to make the affected streets safer and more convenient for cyclists and pedestrians – and for buggy, scooter and wheelchair users. 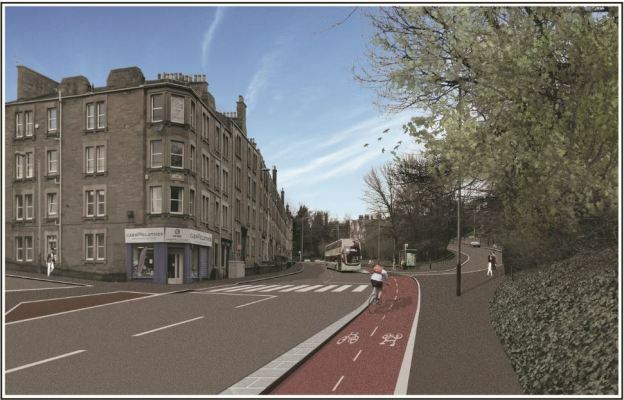 One of the proposed streets for the project is Lochee Road and you can see the early concept designs for Lochee Road and the other streets elsewhere in the city here. The proposals will be judged by a multi-disciplinary panel of experts in April and if successful, further funding will be provided to undertake more detailed engagement and design work during 2019. The project team is keen to get feedback from residents and community groups at this early stage and it is easy to provide your feedback here.